One of the most persistent myths out there is that various socialist countries are doing things perfectly, that their citizens basic needs are completely provided for by their socialist governments and that they have learned to create socialist perfection within their borders. This is stated to be some kind of governmental ideal. This is patently untrue. Leftists often tout Scandinavia as being just such a socialist utopia, but as we will see in a moment, this is complete rubbish. "A number of recent studies have shown that, in many developed countries, including Japan, happiness is not proportional to economic wealth," Nakano said. "This finding, often called the 'paradox of happiness,' has given rise to international discussion on how to enhance individual well-being through government policies." The report also listed a number of practical suggestions for governments to promote happiness among their citizens, including helping people meet their basic needs, reinforcing social systems, implementing active labour policies, improving mental health services, promoting compassion, altruism and honesty, and helping the public resist hyper-commercialism. Surprise, surprise: virtually the totality of the socialist agenda is promoted as a "helpful suggestion" to improve the happiness of citizens. Bhutan, the tiny Himalayan nation that tops Asia in the report, convened Monday's meeting seeking to develop a new economic model based on principles of happiness and well being. Prime Minister Jigmi Y. Thinley told the conference a new model is vital if mankind is to avoid its current unsustainable and self-destructive course. This should surprise no one, since Bhutan's King coined the term "Gross Domestic Happiness" in the first place and immediately used it to promote his political legacy as some sort of politically palatable alternative to liberalization. In its weakest form, GDH means "money can't buy you happiness." More often, it's a way to disparage the profit-driven facts of life that exist any time capitalism is allowed to flourish. But anyway, I was talking about how socialist paradises are a myth. Here's what I mean. The following are the five countries that top the list of the "happiest countries in the world," according to this most recent study. In parentheses beside the name of each country, I have included their rank on the Economic Freedom Index. Contorting these results into the bizarre conclusion that wealth and economic freedom has scant impact on the comparative happiness of a country's citizens is a pretty egregious lie. It is also a patently ridiculous belief. 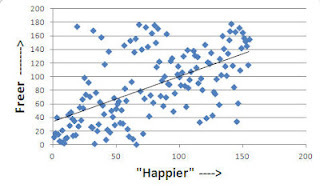 As much as some leftists would love to suggest that socialism is a panacea of communal happiness, the data actually provides strong evidence to the contrary. Like it or not, Scandinavian countries are among the most capitalistic countries in the world. I'm not content to just leave it at that. Here is a plot of all the countries that appear on both lists. The x-axis is the "happiness" ranking, and the y-axis is the freedom ranking. The trendline was added for the reader's benefit. Great analysis! Thanks for making the graph. I would be willing to (try and) make it more interactive if you would like. I would need the source data. I am thinking it would be cool if hovering over the dots exposed what country it was and what the exact score was on each.